Jesse and Josie are best friends. They are big enough for rough and tumble games, but small enough to cuddle at bedtime. Their hair will always look good, I’ve included a photo tutorial in the pattern to show how I add it. Jessie wears a stripy hat and sweater with long trousers and shoes. 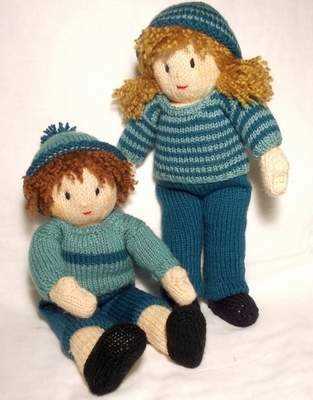 Josie wears a bobble hat, single stripe sweater, Capri length trousers and shoes. My clear and detailed 12-page pattern is full of photos and information to guide you through every stage of knitting, stuffing, adding hair and finishing Jesse, Josie and their 2 outfits. Jesse and Josie have lots of other dress up outfits, simply search for Jesse and Josie to see them! 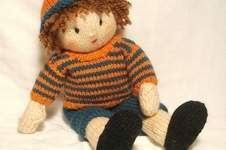 *Recommended yarns- Doll-Paintbox Yarns Simply DK, Vanilla Cream 107 Hair-King Cole Big Value Chunky – Sahara Dolls clothes-Paintbox Yarns Simply DK, or any DK/ Light Worsted weight yarn.